A conference organised by Manchester School of Art in partnership with the Whitworth. Teaching painting in art schools and academies has in recent years undergone several significant changes. As the barriers between media eroded into more fluid borders art schools have responded by adapting and evolving. Many painting departments have been absorbed into general fine art courses but specialist painting courses and pathways still continue to be developed. How have these courses defined and redefined themselves to reflect the current artistic landscape and how can painting maintain an identity within a general fine art course? 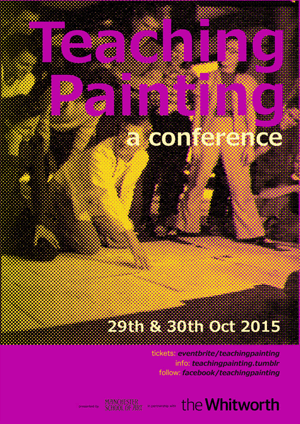 The conference will address the historical, theoretical, pedagogical and continually shifting methods of teaching painting. It asks how and why our approaches to teaching painting have changed and developed and offers a platform through which practices and experience can be shared. Maggie Ayliffe and Christian Mieves, Gordon Brennan, Ian Gonczarow , Sarah Horton and Sarah West, Sean Kaye, John McClenaghen, Dougal McKenzie, Alistair Payne, David Rayson, Liz Rideal, Craig Staff, Sarah Taylor, and Joseph Wright and Stuart MacKenzie. Early bird tickets are priced at £30 per day or £50 for two days (plus booking fee) and include lunch and refreshments. Buy tickets here.